Isaac Davison is a NZ Herald political reporter. 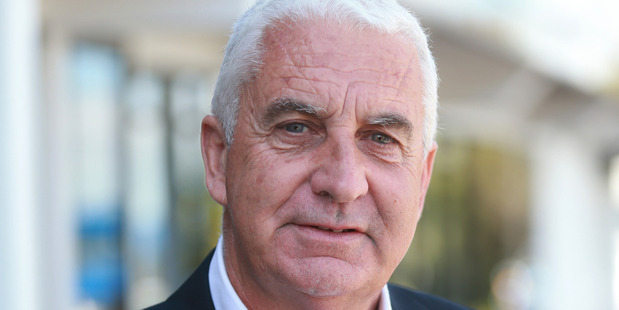 Salvation Army senior policy analyst Alan Johnson says the change of Govt has yet to have an impact on New Zealand's entrenched social problems. 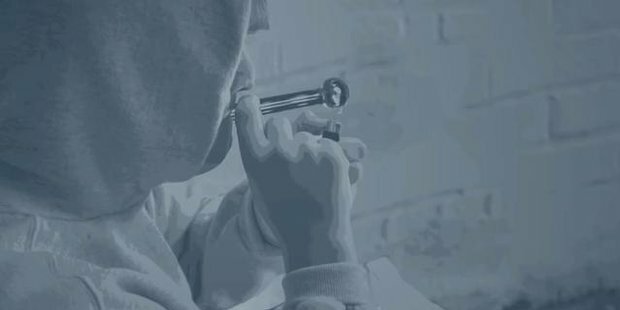 The "unrelenting rise" of methamphetamine in New Zealand is one of the lowlights in the Salvation Army's latest State of the Nation Report. "But if you look at the volume of offences and you know that it is an indicator of what is happening behind the scenes, it is discouraging," Johnson said. Overall, the annually-published report concluded that the change of Government in 2017 was yet to have any noticeable impact on New Zealand's entrenched social problems. The Government could not be blamed for all social changes, either good or bad, said Johnson. "But generally there appears to be a malaise. There's been no evidence of any progress in terms of addressing inequality and the vulnerability of our most marginalised kids." 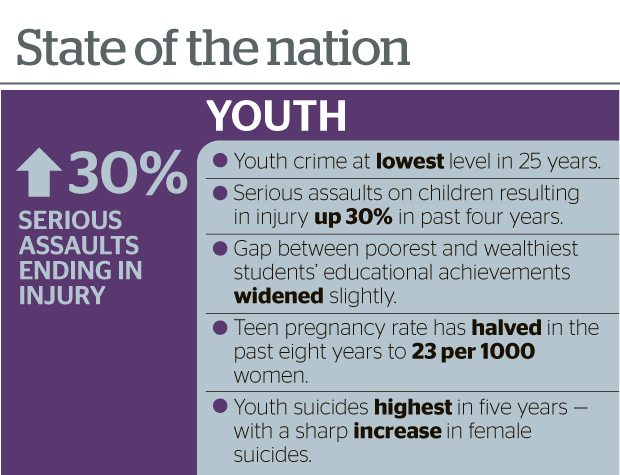 The State of the Nation report highlighted that youth crime was at its lowest rate in 25 years, and that teen pregnancies were falling sharply. Of greatest concern were "unnacceptably high" levels of child abuse and neglect, which had barely changed in four years. Serious assaults on children had risen by 30 per cent in that time. Larger, structural problems for young people were also growing, in particular the gap between poor and wealthy students' achievement at school. Youth suicide rates - which the Salvation Army considered a key indicator of mental health and social engagement - had not fallen in the last year, and had risen for women. 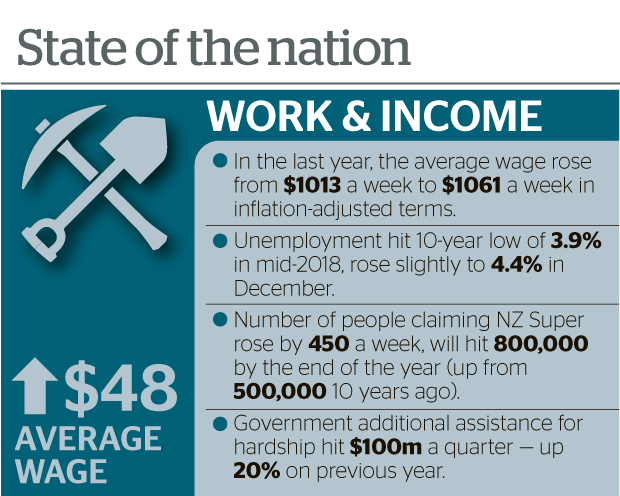 There has been modest growth in wages in the last year, which appeared to be driven by an increase to the minimum wage rather than market pressures. And the gap between women's and men's hourly earnings is gradually closing. The Salvation Army said it was delighted that demand for its food parcels had reduced in the last year, reversing a 10-year trend. That could be the result of increased Government support for households in hardship, which tops $100 million each quarter - much of it going towards food and housing costs. 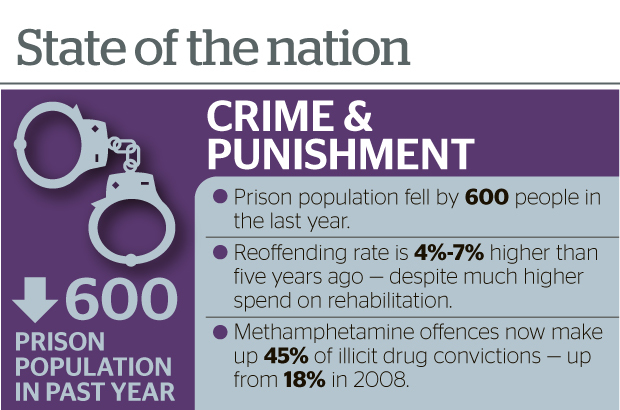 There were some positives in the criminal justice sector, in particular a fall in the prison population of 600 people in the last year. While this was a significant reversal after years of rising prisoner numbers, the muster was still 20 per cent higher than five years ago. The Salvation Army also said there had been "absolutely no progress" on reducing reoffending in three years. That is despite big increases in the amount being spent on rehabilitation within prisons - the equivalent of $29,000 per prisoner a year. On the positive side, building activity finally caught up with population growth in Auckland in the last year. That has partly contributed to house prices flattening out. The cost of renting has also stabilised in the city. Home ownership remains unaffordable in Auckland. And the affordability problem has been transferred elsewhere as fleeing Aucklanders appear to drive prices higher throughout the North Island. "This is not good news for poorer tenant households in these cities, who are literally being crowded out," said the report. "And this is witnessed by growing waiting lists for social housing." 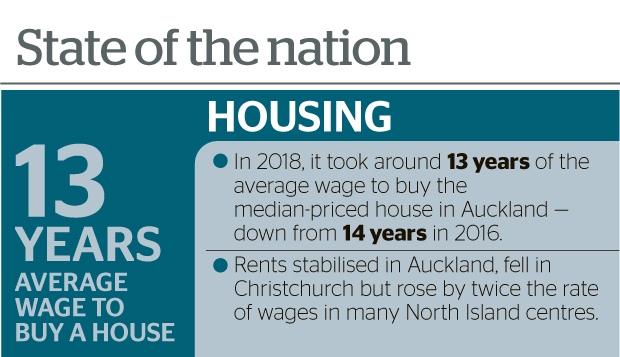 While average rents were steady in Auckland and fell in Christchurch, in other parts of the North Island rents rose at twice the rate of incomes.